outer join – Java, SQL and jOOQ. Perhaps the most powerful SQL feature is the JOIN operation. It is the envy of all non-relational databases, because the concept is so simple, yet so universally applicable, when you want to “combine” two data sets. Put simply, when joining two tables, you’re combining every row from one table with every row from another table, for which a certain predicate is true. An illustration from our SQL Masterclass shows it. See also our recent article about using Venn diagrams to illustrate JOINs. The above illustration compares INNER JOIN with different OUTER JOIN operations, but those are far from all possibilities that we have. Let’s look at things from a more systematic angle. Do note that whenever in this article I say “X happens before Y”, I mean that “X happens logically before Y”. The database optimiser may still choose to execute Y before X, because that is faster without changing the outcome. More information about the syntactic / logical order of operations here. But let’s look into all the join types, individually! Now, for each days/departments combination, you could calculate the daily revenue for that department, or something similar. A CROSS JOIN is a cartesian product, i.e. a product as in “multiplication”. The mathematical notation uses the multiplication sign to express this operation: A × B, or in our case: days × departments. Just like with “ordinary” arithmetic multiplication, if one of the two tables is empty (size zero), then the result will also be empty (size zero). This makes total sense. If we combine the previous 31 days with 0 departments, we’ll get 0 days/departments combinations. Likewise, if we combine an empty date range with any number of departments, we also get 0 days/departments combinations. In general, I strongly recommend to use the CROSS JOIN keyword instead of comma-separated lists of tables, because if you intentionally want to do a CROSS JOIN, nothing communicates this intent (to the next developer!) better than using the actual keywords. So many things can go wrong, accidentally, with comma-separated lists of tables, including accidental cross joins. You don’t want those! In most databases, the INNER keyword is optional, so I’m just omitting it in this article. Notice how the INNER JOIN operation allows for putting arbitrary predicates in the ON clause, which is again very useful when doing reporting. Just like in the previous CROSS JOIN example, we’re combining all days with all departments, but then we retain only those days/departments combinations for which the department already existed, i.e. for which the department creation preceded the day. So, we’d get no results prior to January 10, those rows were filtered out. INNER JOIN operations are filtered CROSS JOIN operations. This means that if one of the two tables is empty, then the result is also guaranteed to be empty. But unlike with CROSS JOIN, because of the predicate, we can always get less results than the CROSS JOIN would deliver. All of these syntaxes do the same thing, usually without performance penalty, but clearly, they’re all less readable than the original INNER JOIN syntax. Sometimes, e.g. in literature, you will hear the term EQUI JOIN where "EQUI" isn’t really meant as a SQL keyword, but just as a specific way of writing a special kind of INNER JOIN. The above query selects all actors and their films. There are two INNER JOIN operations, one connecting actors to the corresponding entries in the film_actor relationship table (because actors can have many films and films can have many actors), and the other connecting each film_actor relationship with additional information about the film itself. The characteristics of this operation are the same as those of the “general” INNER JOIN operation. An "EQUI" JOIN is still a cartesian product (CROSS JOIN) with a reduced set of results, i.e. containing only those actor/film combinations for which a given actor actually played in the given film. The result size can only be equal to the actor size multiplied by the film size, if every actor played in every film, which is unlikely. If you want to join by ORIGINAL_LANGUAGE_ID, you’ll have to resort to the ON clause. Notice how we no longer need to specify any JOIN criteria, because a NATURAL JOIN will automatically take all the columns that share the same name from both tables that it joins and place them in a “hidden” USING clause. As we’ve seen before, as primary keys and foreign keys have the same column name, this appears quite useful. We’ve seen INNER JOIN before, which returns results only for combinations of the left / right table, for which the ON predicate yields true. Again, the OUTER keyword is optional, so I’m omitting it in the examples. In other words, each day appears at least once in the result. LEFT JOIN does this for the left table, i.e. it retains all rows from the left table in the result. The new departments 4 and 5 will not be in the previous results at all, because they were created on a day after January 31. But it will appear in a RIGHT JOIN result, because departments is the right table of the join operation, and all the rows from the right table will be retained. In most cases (I have to yet run into a situation where this isn’t the case), Each LEFT OUTER JOIN expression can be transformed into an equivalent RIGHT OUTER JOIN expression, and vice-versa. Because RIGHT OUTER JOIN is usually a bit less readable, most people use LEFT OUTER JOIN only. Finally, there is also FULL OUTER JOIN, which retains all rows from both sides of the JOIN operation. In our example, this means that each day appears at least once in the result, just like each department appears at least once in the result. And of course, this also works with NATURAL LEFT JOIN, NATURAL RIGHT JOIN, NATURAL FULL JOIN, but again, these aren’t useful at all, as we’d be joining again USING (..., LAST_UPDATE), which makes no sense at all. That’s nice, given that at some point in time (in the 80s?? ), ANSI didn’t specify OUTER JOIN yet. But the 80s are more than 30 years ago. So, it’s safe to say this stuff is obsolete. SQL Server did the right thing and deprecated (and later removed) that syntax a long time ago. Oracle still supports it for backwards compatibility reasons. But nothing about this syntax is reasonable or readable. Don’t use it. Replace it with ANSI JOIN. This is Oracle specific, but I must say, it’s a real shame none of the other databases have stolen the feature yet. Remember the CROSS JOIN operation that we used to combine each day with each department? Because, sometimes, that’s what we want in the result: All combinations, and if there is a match put also the matching values in the row. As you can see, I’ve visually created 5 partitions for the 5 departments. Each partition combines the department with each day, but unlike when doing a CROSS JOIN, we’re now getting actual LEFT JOIN .. ON .. results in case there is a match for the predicate. This is a really nice feature for reporting in Oracle! In relational algebra, there is a notion of a semi join operation, which unfortunately doesn’t have a syntax representation in SQL. If it did, the syntax would probably be LEFT SEMI JOIN and RIGHT SEMI JOIN, just like the Cloudera Impala syntax extension offers. What is a "SEMI" JOIN? What we really mean is we want all actors that played in films. But we don’t want any films in the results, just the actors. More specifically, we don’t want each actor several times, once per film. We want each actor only once (or zero times) in the result. Semi is latin for “half”, i.e. we implement only “half the join”, in this case, the left half. We’re looking for all the actors for which there exists a film, i.e. actors that played in a film. With this syntax (i.e. "SEMI" JOIN placed in the WHERE clause), it’s immediately clear that we can get each actor at most once in the result. There’s no actual JOIN in the syntax. Apart from being the optimal solution in terms of correctness, there are also some performance benefits when using "SEMI" JOIN rather than INNER JOIN, as the database can stop looking for matches as soon as it found the first! If your database supports both syntaxes for the "SEMI" JOIN operation, you may choose whichever you prefer from a stylistic point of view. Watch out! While EXISTS and IN are equivalent, NOT EXISTS and NOT IN are not equivalent. This is because of NULL values. Here’s a nice article about three-valued logic by Joe Celko, if you want to learn more. Do not use NOT IN predicates in SQL, ever, unless you put constant, non-null values there. — Lukas Eder. Just now. Now, I personally don’t like this syntax, as it doesn’t communicate the intent of an "ANTI" JOIN at all. And chances are, it is slower, because your optimiser doesn’t recognise this as an "ANTI" JOIN operation (or in fact, it cannot formally prove that it probably is). So, again, use NOT EXISTS instead. Indeed, instead of a CROSS JOIN between all departments and all days, why not just generate the necessary days for each department directly? That’s what LATERAL does. It is a prefix to the right-hand side of any JOIN operation (including INNER JOIN, LEFT OUTER JOIN, etc.) that allows the right-hand side to access columns from the left hand side. This of course has nothing to do with relational algebra anymore, because it imposes a JOIN order (from left to right). But sometimes, that’s OK and sometimes, your table-valued function (or subquery) is so complex, that’s the only way you can actually use it. The result of the above correlated subquery is one row and one column. If you ever need to return more than one row and/or more than one column from a correlated subquery, LATERAL or APPLY will be your friend. Note also how I’ve used LEFT OUTER JOIN together with LATERAL, and then I needed to put a dummy ON true clause for syntax correctness. Using LATERAL with OUTER JOIN will again always retain the left side of the JOIN, i.e. we’ll retain actors that didn’t play in any film. Even if the right table is produced on a per-row-of-the-left-table basis. You can use LATERAL also with OUTER JOIN, in case of which the left rows will be retained even if your table function doesn’t return any rows on the right side. Same story! SQL CROSS APPLY / CROSS JOIN LATERAL is the same thing as Java’s Stream.flatMap(). In fact, SQL and streams aren’t too different anyway. For more info, read this blog post here. Note: Just like we could write LEFT OUTER JOIN LATERAL, we can also write OUTER APPLY in case we want to retain the left side of the JOIN expression. Few databases implement this (in fact, only Oracle), but if you think about it, it’s an awesome JOIN type. One that creates nested collections. If all databases implemented it, we wouldn’t need ORMs! The MULTISET operator takes a correlated subquery argument, and aggregates all its resulting rows in a nested collection. This works in a similar fashion as a LEFT OUTER JOIN (we’re getting all actors, and if they have films, we’re getting all their films too), but instead of duplicating all the actors in the result set, we’re collecting them into a nested collection. Ignore the incompleteness of used JPA annotations, I just want to show the strength of nested collections. 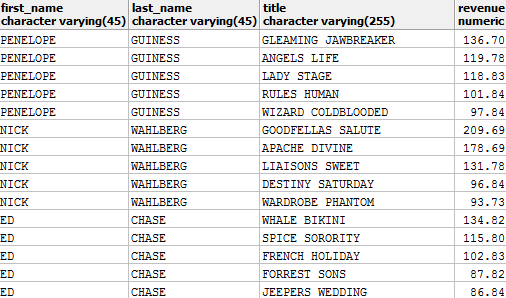 Unlike as in ORMs, the SQL MULTISET operator allows for collecting arbitrary results from correlated subqueries into nested collections – not just actual entities. This is million times more powerful than what any ORM could ever dream of. A bit more verbose, but still does the trick! Excellent! Tell me that you don’t find this exciting and I don’t know what is. Our SQL Masterclass – where we go into these features (and many other features) in depth! Are You Using SQL PIVOT Yet? You Should! Oracle‘s name is no coincidence. It is truly an oracle, telling you mystical, secret things about your database. It may take great expertise and skill to optimally extract that knowledge from this monster. 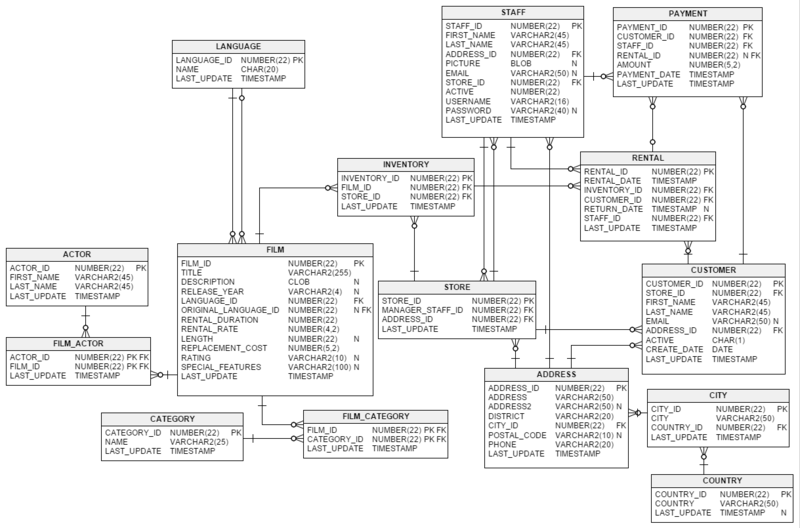 While it implements vast parts of the SQL:2008 standard, it ships with a lot of features no other database has, but which are likely to make it into the SQL:2011 and subsequent standards, eventually. One particular syntax clause is the PARTITION BY clause. It is very similar to the GROUP BY clause, but it can appear in various other contexts. The most trivial one is that of window functions / analytical functions. The most advanced one is that of the MODEL clause (which I shall blog about soon). But one of the most hidden ones is that of the OUTER JOIN clause. With Oracle, you can issue a “partitioned outer join”. The query_partition_clause is a regular “PARTITION BY expr” clause. Now, this useful addition that can be put to the left or to the right of the actual OUTER JOIN clause, allowing to specify a means of how to partition either side in a way that there will be at least one (possibly empty) record for every partition, in case the OUTER JOIN does not produce any records for such a partition. Whew. In more intelligible English: This clause helps filling your result set with blank records. There!